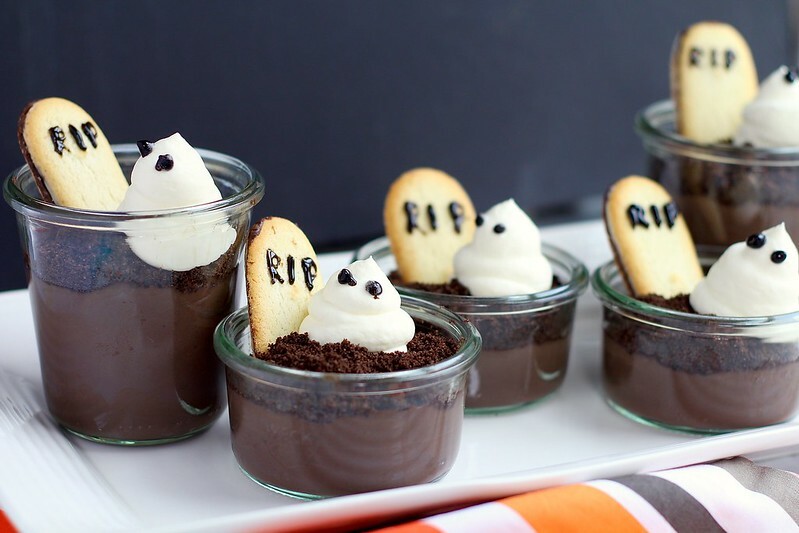 So, I couldn’t resist sharing one last cute, Halloween-themed dessert. I originally made these for my youngest daughter’s daycare party, but it got rescheduled, so I ended up bringing something else instead. Since I had the pudding already made in the refrigerator and the rest of the ingredients sitting on the counter, staring at my every time I walked by, I decided I should just make some for us anyway. I mean the pudding had to be eaten anyway, I couldn’t bare to waste it… Or that’s what I told myself. Besides, these are so stinkin’ cute, I couldn’t resist. This is homemade pudding people, no instant pudding mix. But, if you’re in a pinch, that would totally be acceptable. Now that my kids are a little older, I am able to take more time in the kitchen. But if you have a baby still on the hip, or multiple babies, or you’re just too dang tired to cook, grab that instant pudding box off the shelf. I won’t judge. But, if you decide to go the homemade pudding route, you certainly won’t regret it. This pudding is wonderfully rich and creamy, but not overly sweet. On the contrary actually, it’s just right. Ground Oreos are sprinkled over the pudding to create a “dirt” look. Then Milano cookies (I couldn’t resist using both mint and salted caramel) are stuck in the dirt to look like gravestones. You can use edible markers or a little melted chocolate to write R.I.P. on the cookies. 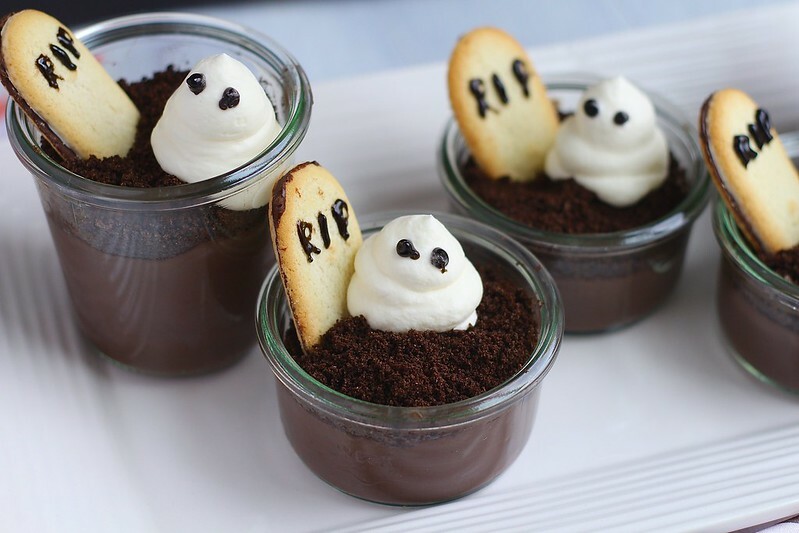 To finish, little whipped cream ghosts are piped into the dirt to make it spooky. Again, melted chocolate can be used to make the eyes in the ghosts. Unless you are lucky enough to have candy eyes in your grocery store. 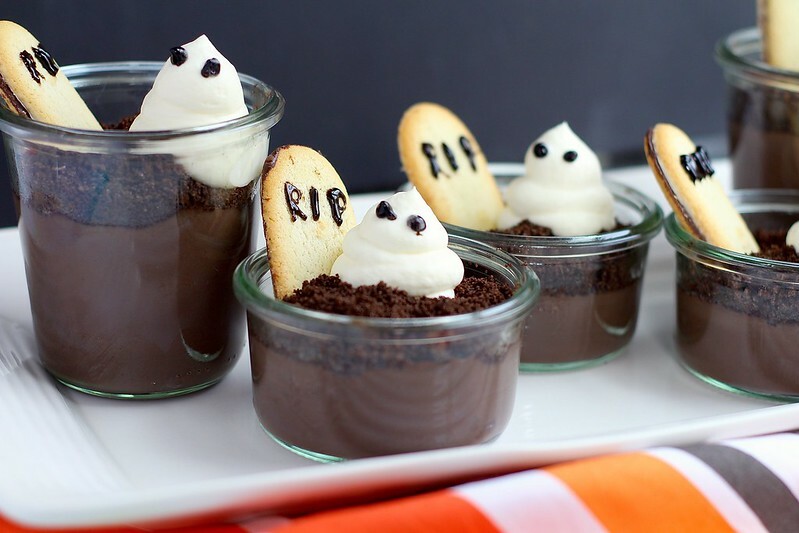 So, if you’re in need of a last minute Halloween treat, make these cuties. Happy Halloween! To make the pudding, whisk together the sugar, cornstarch, cocoa powder and a pinch of salt in a large heavy bottomed pot. Gradually whisk in the milk and cream, whisking until smooth. Place over medium-high heat, whisking constantly, until the mixture thickens, 5-10 minutes. Remove from the heat and whisk in chocolate chips and vanilla extract. Stir until melted and smooth. Transfer the pudding to 8-10 small dishes or jars. Cover the surface with plastic wrap, pressing down on the pudding, to prevent a skin from forming. Place in the refrigerator until cool and set, about two hours, or overnight. Once the pudding has cooled, sprinkle the Oreo crumbs over the top of the pudding. 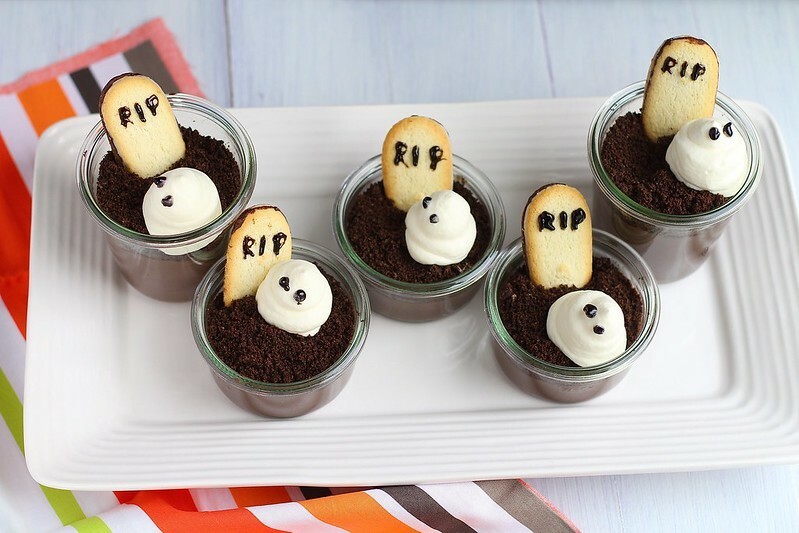 Place a cookie in the “dirt” to create a “gravestone”. Place the whipped cream in a ziplock bag with the corner snipped off, or in a pastry bag and pipe a small ghost next to the gravestone. Pipe chocolate eyes on or use candy eyes. Serve immediately. *If you can’t find an edible marker, melt 1/4 cup chocolate with 1 teaspoon oil and place in a ziplock bag with one corner snipped off.